Heat oven to 350°F. Spray 12x8-inch (2-quart) baking dish with cooking spray. In large (at least 4-quart) microwavable glass bowl, mix broccoli, bell pepper and water; cover with plastic wrap. Microwave on High 4 to 5 minutes, stirring after 2 minutes, until broccoli is bright in color and hot; drain. Return broccoli and bell pepper to bowl. Place cream cheese spread and milk in medium microwavable glass bowl. Microwave uncovered on High 1 minute; use whisk to blend (mixture will have a few small lumps). Stir dressing mix into cream cheese mixture; mix well. Add cheese; stir to combine. 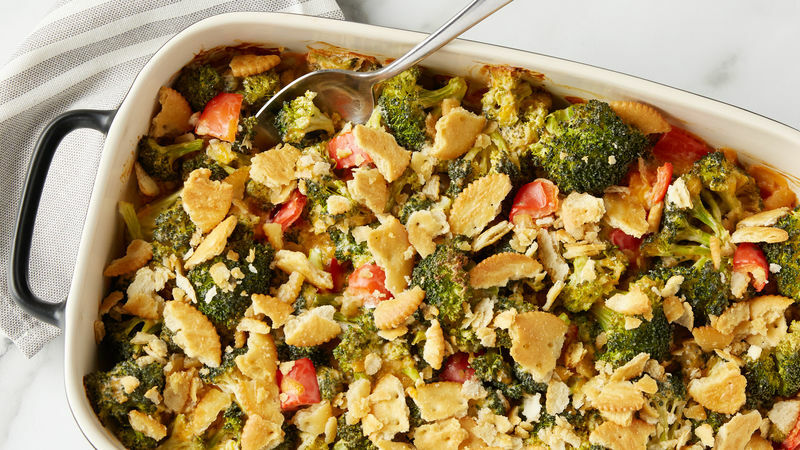 Pour cheese mixture over broccoli and bell pepper; toss to coat. Spread in baking dish. In small bowl, toss crackers with melted butter. Sprinkle over broccoli. Bake 25 to 30 minutes or until hot and bubbly. If desired, a 4-oz jar of diced pimientos, drained, can be used in place of the red bell pepper. Add pimientos into the ranch mixture with the Cheddar cheese. Depending on the grocery store, broccoli can be purchased as stalks or crowns. Broccoli crowns are the tops of the broccoli stalks trimmed just under the broccoli head. Broccoli crowns give more florets per pound and create less waste but are often more expensive than the broccoli stalks. Always purchase broccoli with bright green color, compact clusters of florets and firm stems. Avoid broccoli with yellow flowers.